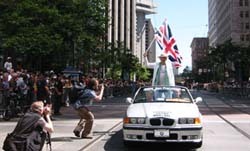 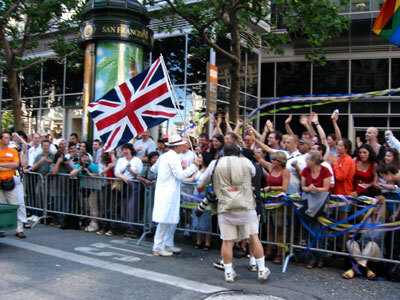 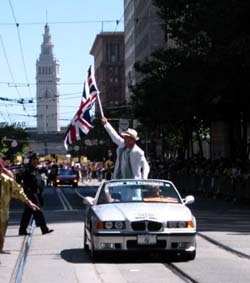 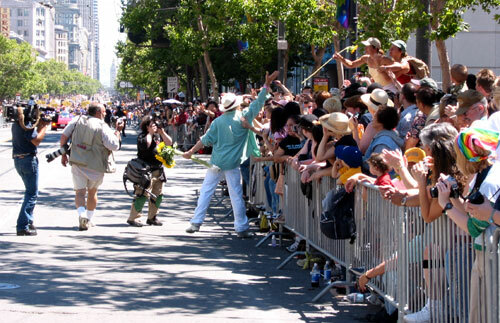 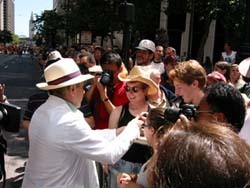 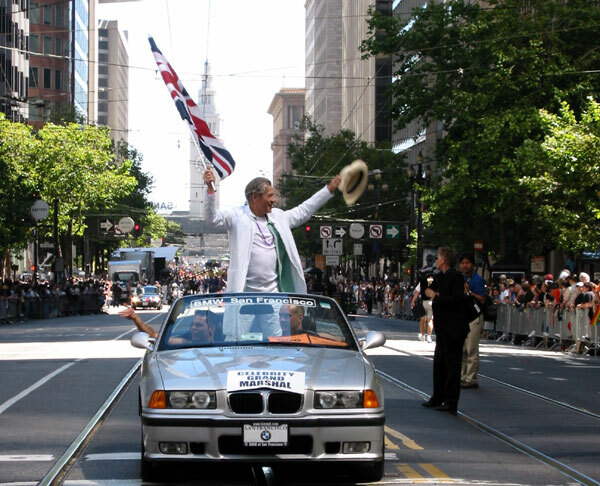 Sir Ian was "Celebrity Grand Marshal" leading the annual Lesbian/Gay/Bisexual/Transgender Pride parade before a crowd of more than 500,000 spectators in San Francisco. 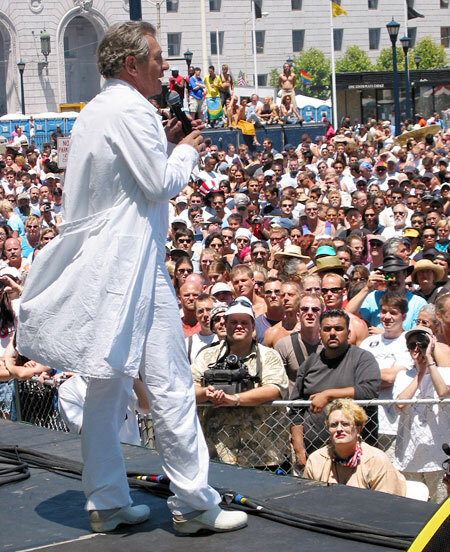 Leading up to the main event, he made the rounds of related events supporting gay rights and activist organizations in San Francisco. 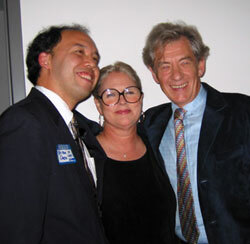 Sir Ian attended a "Media/Sponsor" party at the new LGBT Community Center on Market Street in San Francisco. 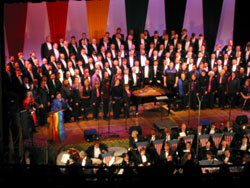 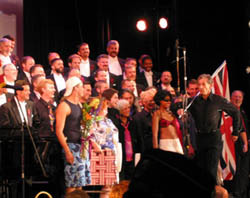 Sir Ian and Sharon Gless appeared with The San Francisco Gay Mens Chorus, the Lesbian/Gay Chorus and the Lesbian/Gay Freedom Band in the beautiful auditorium at Everett Middle School in San Francisco. Sir Ian performed a monologue from Shakespeare's Sir Thomas More. 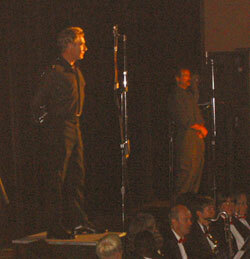 About to begin Sir Thomas More (ASL interpreter at right). 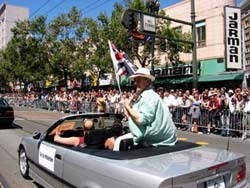 For their appearance with the Gay Mens Chorus at Evertt Middle School in San Francisco, Sharon Gless and Ian McKellen shared a dressing room in a converted classroom. 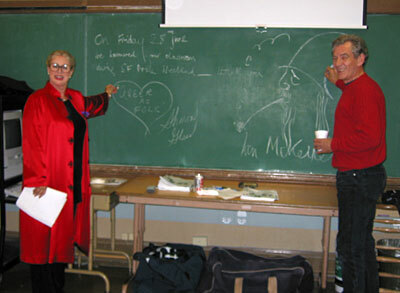 In between shows they autographed the blackboard. 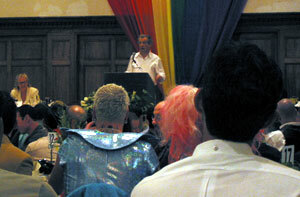 Sir Ian addressed attendees of a fundraising brunch sponsored by CAPE to benefit the Positive Resource Center. 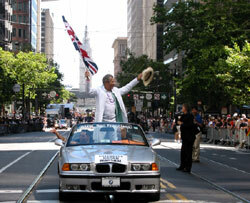 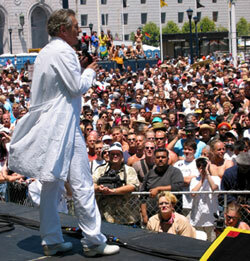 Sir Ian led the annual Lesbian/Gay/Bisexual/Transgender Pride Parade as "Celebrity Grand Marshall"